24/7 emergency water leak and burst pipe plumbers. For fast attention to your water leaks or burst pipes – call 1300 975 862. If a pipe at your property has been damaged, dug up, nailed, bumped, smashed, squashed or, a fitting was too loose, too tight or just perished – you have a problem. Our team of licensed plumbers will be at your property asap. We're available 24/7 for burst pipe repair/plumbing at homes and businesses in Moorabbin and surrounding suburbs. At Xceptional Plumbing, we use all of the tricks of the trade to find where your problem is – without demolishing half of your property to do so. Thermal imaging, pressure testing and pipe tracing equipment all assist us to find the cause of your issue. Once located, we are able to identify the cause (often for insurance purposes) and then set about fixing the leak or burst point. 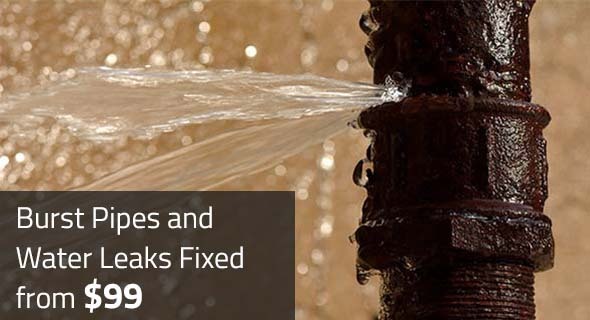 Water leaks can cause a bit a damage, so if this is the case – not only can we fix the cause, but we can assist you with the restoration work. We work with a team of contractors who we know and trust, and can complete all required repairs. This remediation work will normally be covered by insurance, with our extensive experience enabling us to provide detailed insurance reports for fast and pain free claims.